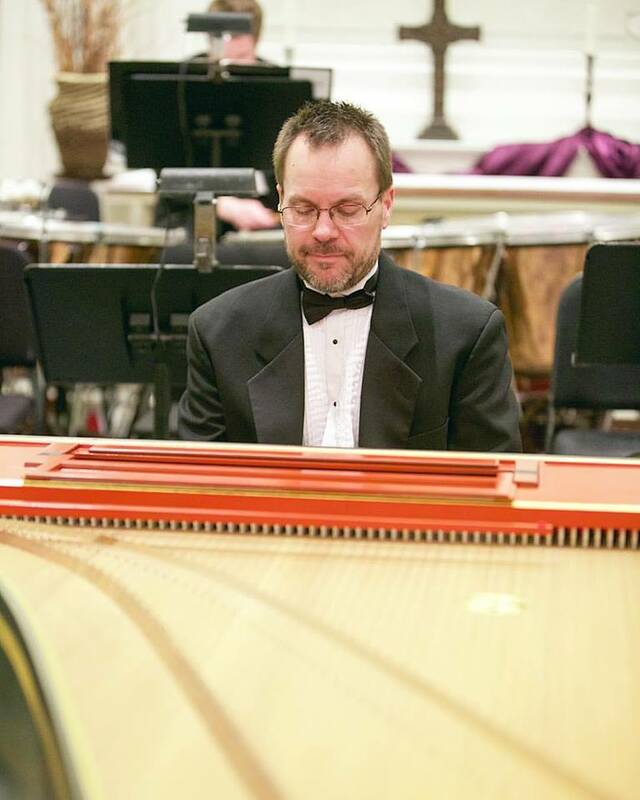 I make my living as a professional musician residing in Grand Rapids, Michigan working as a composer and arranger, choral conductor, organist and pianist. My primary work has been done in the context of liturgy, playing instruments, running choral programs, and writing music for liturgical use. In addition to these, I bring to my work significant skills in written and oral communication and in the use of computer applications for composition, audio recording and editing, organizational administration, and basic graphic design. Music has been a part of my life since...well, since I was that little. Here is a transcription of, literally, the first thing I ever played. How do I know? That Magnus Chord Organ was a Christmas gift, the same Christmas my brother got a reel-to-reel recorder from Santa. On that tape, I was recorded playing this tune (luckily, it exactly fit the keyboard). ​My interest in organ, and later, piano, led me to study these in college, along with composition -- a little late, but I had developed some basic chops in high school, enough for my patient teachers to work with. Go, Powers Chargers. (Horses, not anything electric, actually.) This high school was rather magical, though. Lots of great memories and lots of great people. ​Go, Maroons. An ironic name, accidentally. For example, the first man-made nuclear reaction occurred there, under the football field, so, clearly very smart people are found there. Unfortunately, our football team was incinerated and the program has never fully recovered. Lifelong learning has followed ever since, with expert conductors, players, and generally much smarter people who generously share their knowledge. ​ With all these teachers in my head, much of what they taught me I bring to my work at St. John's Episcopal, the Grand Rapids Symphony Chorus and Orchestra, and Mystical Voices (a wonderful small ensemble of highly skilled singers and musicians), along with other ensembles and performers I am privileged to play for. My lifelong work with the Roman Catholic church, culminating in a wonderful eight years with the Paulist Fathers at the Cathedral of Saint Andrew, formed my liturgical sensibilities and guided me to produce a number of short works for choir and a variety of instrumental ensembles. Along with all that professional stuff, I have three wonderful and amazing kids who have grown to be even more wonderful and amazing adults. After a struggle with being honest to my wife, family, and friends, life changed in 2006. I came out as gay and have since lived a little more authentically. 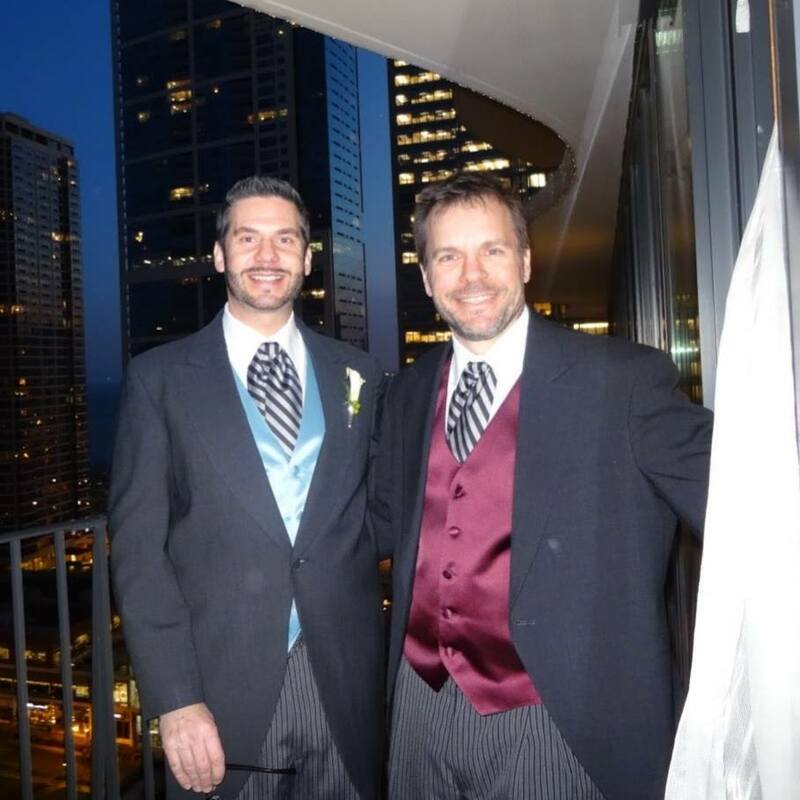 This is a pic of my husband and I after we married in 2015. Life is good, short, and full of as much joy as you care to find. And cats. Lots of cats. If you are interested in any of this or want to connect easily, connect with me on Facebook.